Our rabid desire to consume ALL GRAPHIC NOVELS EVER PRODUCED IN THE HISTORY OF THIS PLANET NAY GALAXY all started with Keiji Nakazawa's Hadashi no Gen (Barefoot Gen) - which, incidentally, is a film (we just can't find a copy). We picked it up a few weeks ago, intrigued by the cover and description: a graphic novel about Hiroshima. Having just finished a fabulous biography about J. Robert Oppenheimer - American Prometheus, which you must all drop what you're doing and go read NOW - we were very curious to see the same topic - the atomic bomb - treated from a dramatically different perspective in a dramatically different medium. American Prometheus is the mother of a biography: nearly a thousand pages, and full of Pulitzer Prize-winning writing about all the fascinating details of being Oppenheimer. How could a graphic novel (we were still calling it a "mere cartoon" two weeks ago) compare? Well, the best - and most startling - thing about Barefoot Gen was that it held its own against the Oppie bio (and how! ), offering an insightful, provocative and deeply affecting portrayal of a working class family from Hiroshima struggling to get by in the last days before city was bombed. Told from the perspective of the family's middle child, Gen ("Roots"), the story follows the quotidian joys and sorrows of being poor and pacifist when everyone else seems to have caught war frenzy. Gen's father, a tough-yet-kind patriarch drawn in heavy, block-like lines, is stubbornly pacifist - and this brings endless grief to the family, who are humiliated and attacked again and again by the other townspeople for their beliefs. Eventually, this even drives the oldest son to join the Imperial Navy in a last-ditch effort to alleviate the family's shame. This son's experiences then form an important anti-war subplot in this already very anti-war book - with one of the most powerful moments occurring when he runs into a pair of kamikaze pilots on one last, desperate bender before they fly out the next day. Our edition of the book has an introduction by Art Spiegelman, who has some interesting reflections on the book: the Disney-like drawing style for Gen and his little brother, the blunt storytelling, the ambiguous attitudes towards America. 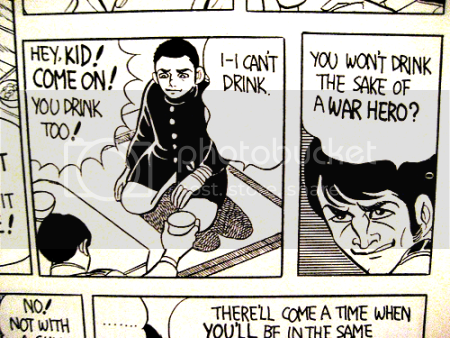 This is all true: Barefoot Gen offers a very straightforward portrayal of Japan during the war. Its only accusations are inward: against the bourgeoise, xenophobic attitudes of the wartime Japanese elite. And it goes to great pains to reveal the cultural pressures that drove so many soldiers and citizens to support the war and Emperor unquestioningly. From a national perspective, it's a biting, cynical criticism of "patriotism" and "valor in war". Interestingly (even eerily), from an international perspective, America isn't present at all. In light of slightly more recent evidence which shows that President Truman dropped the bomb after learning that Japan would surrender (see American Prometheus for a lot more on this), this book's attitudes towards the US seem too forgiving. But enough of politics. The narrative structure is blunt and lacking in nuance, but the story still remains incredibly affecting. Partly this is because we know the story is semi-autobiographical, and the weight of the topic is enough. Also, while the storytelling isn't subtle, it is very skilfull - the use of the burning sun to mark the passage of time, like a countdown to the bomb we know will soon drop, steadily builds the tension. Indeed, the bombing itself occurs in the very last few pages, and the impact is enormous: by this point, we had become so immersed in Gen's life that we had almost forgotten about the bomb! Plus, we had become incredibly invested in all the characters - watching the inevitable catastrophe occur was devastating! Another great (and very cinematic) moment occurs earlier in the book, when the oldest son, after an argument with the father, leaves town to join the Navy. Everyone - the mother, the other children, the PPCC - are freaking out, because this might be the last time the father sees his son. We have a few short panels of the son in the train, thinking about his family, and then, just as the train speeds up out of the station, he sees his father standing in the field by the train tracks, raising his arms and yelling, "Banzai!" (Live long!) It's a wonderful moment which lends itself perfectly to the screen, reminding us of some of those epic sequences from Steven Spielberg's early film about wartime Asia, Empire of the Sun. In conclusion, this was just great. We read this on a packed airplane, stuffed between two large men, and bawled into our tray table (before storing it in an upright and locked position). We also discovered a whole new world (a new, fantastic point of view!) - the graphic novel - and learned yet more about things which fascinate us (Japan, Oppenheimer, etcetera). Definitely check this out. Excellent review. 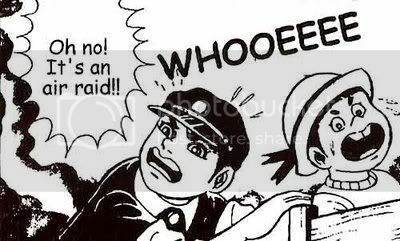 Barefoot Gen is one of the best graphic novels I have read.. I have read 4 volumes (translated) of the series, yet to get hold of the remaining 6. Opened my eye to the politics and the terrible after-math of the atomic bombing. I have seen the animated movie version, which is quite faithful to the book. mekie - Thanks for the link! I had stumbled on that review before, probably when I was busy pilfering pictures of the comic from the internet. Wow, I'd love to check out the movie version!